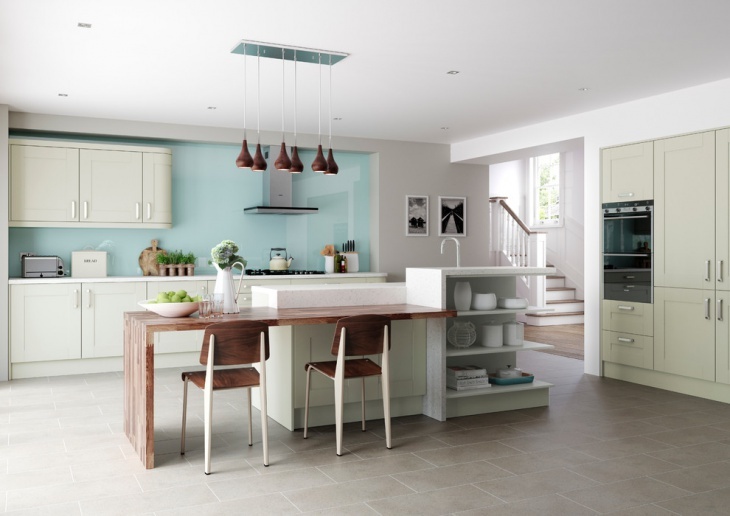 A well-designed kitchen space not just looks neat and pretty but can also save you from a lot of clutter. A well-organized kitchen makes your job much easy. It is one of the most important spaces in the house and should, therefore, be well decorated. 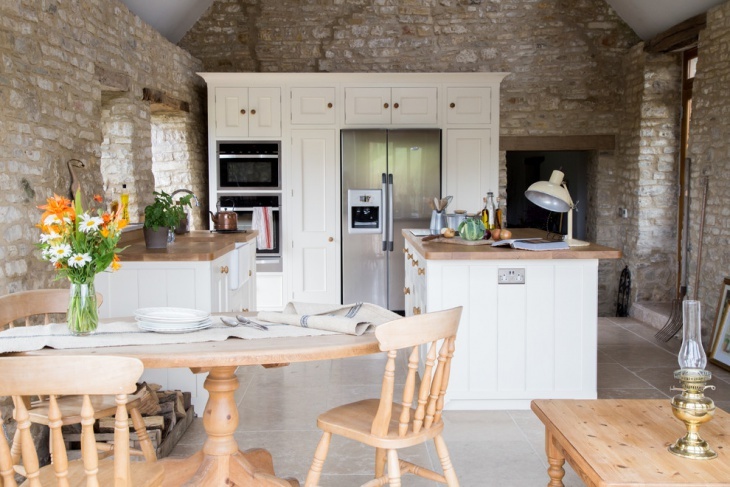 Whether your kitchen style is traditional or modern, we have got some of the coolest kitchen decorating ideas for you. 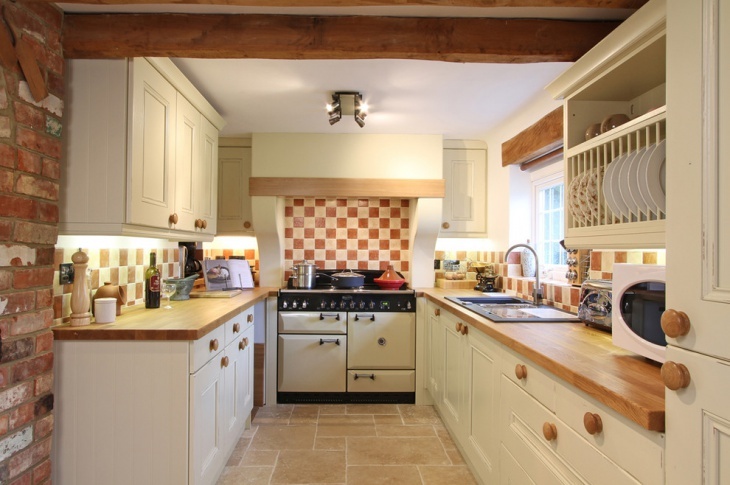 This traditional kitchen contains white cabinets that are spread across the entire kitchen space. 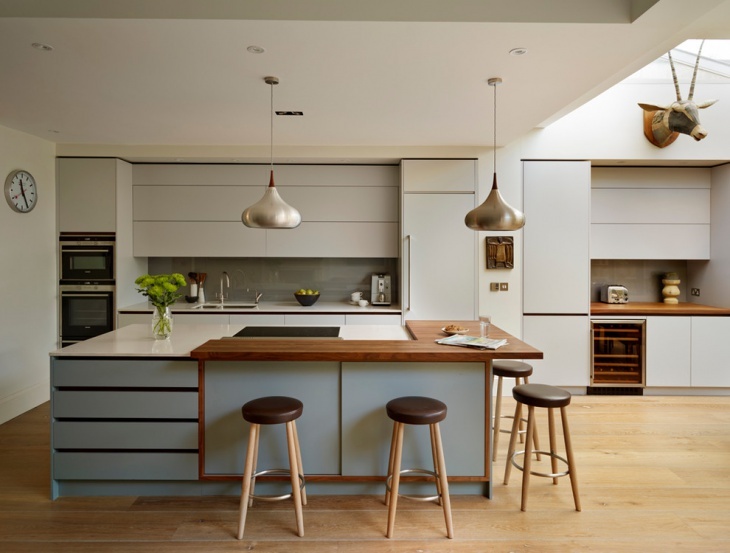 Complementing with a dark wooden flooring, and hanging ceiling lights alongside a marble top table placed in the center with seats, this kitchen is certainly a well designed one. 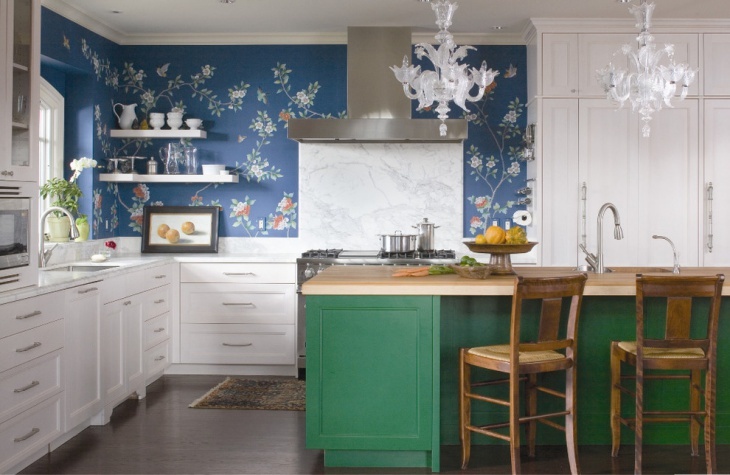 This is a unique kitchen décor idea that has a blue wall with floral printed designs in it. It features traditionally styled chandeliers hanging from the ceiling, white cabinets and also a green cabinet with a wooden countertop which can also be used comfortably for chopping vegetables. 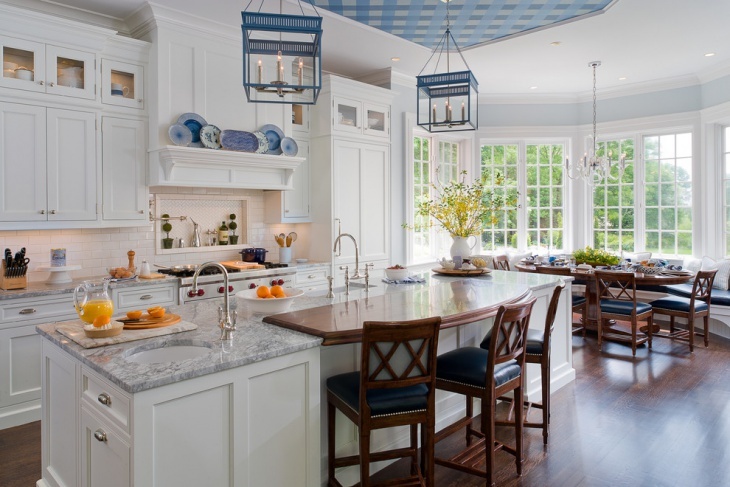 This kitchen has a blue and white color scheme which makes the kitchen look classy and sophisticated. 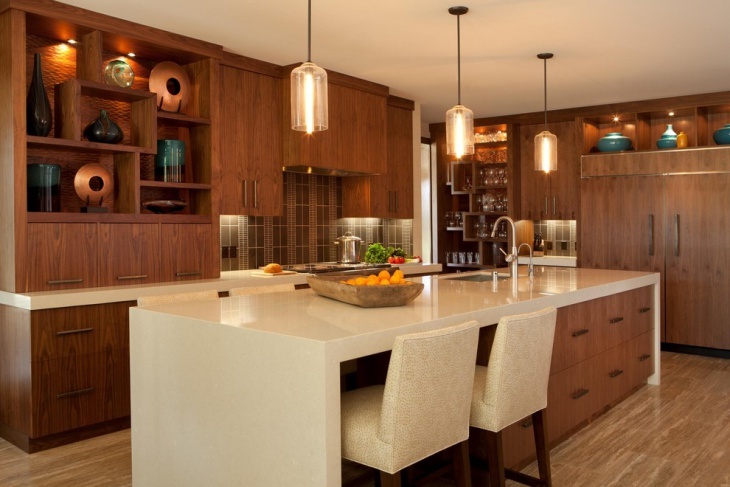 Featuring blue lantern like lights that hang pretty on the ceiling wall, it makes the kitchen space look exceptional. It also has a gray marble top countertop with an under mount sink and attached to it is a wooden table along with some seats. 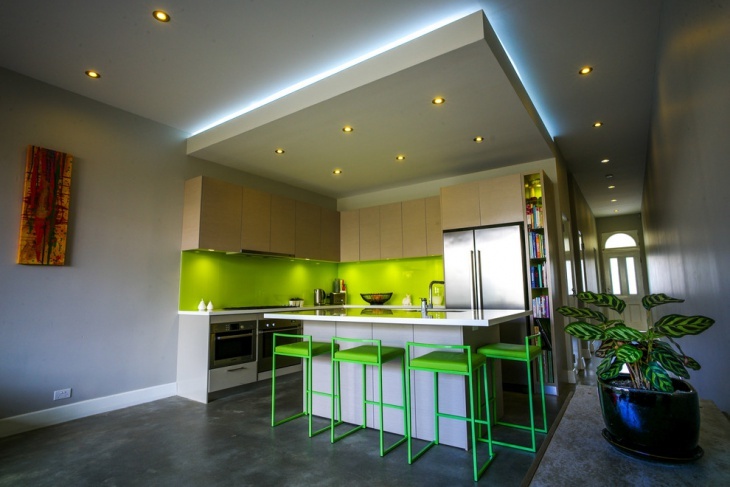 This colorful kitchen with modern interiors is simple and compact. 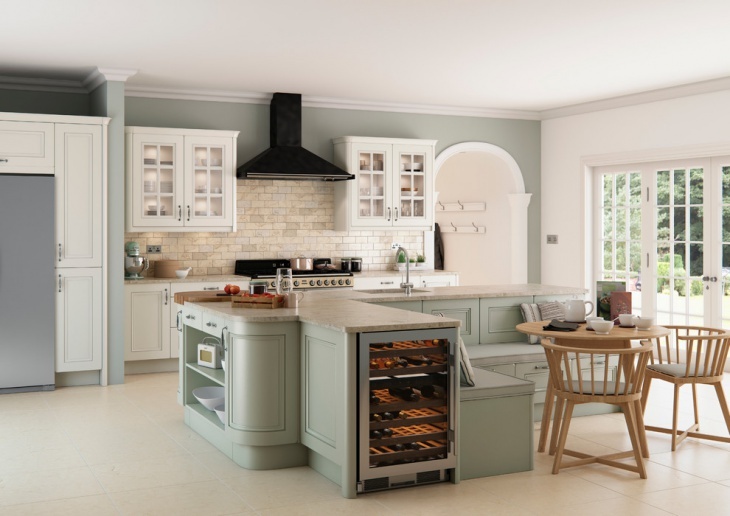 It has gray colored cabinets, wall frames, a special cabinet with a large countertop and at the back of it, there’s space for some cookery books and crockery to be placed. 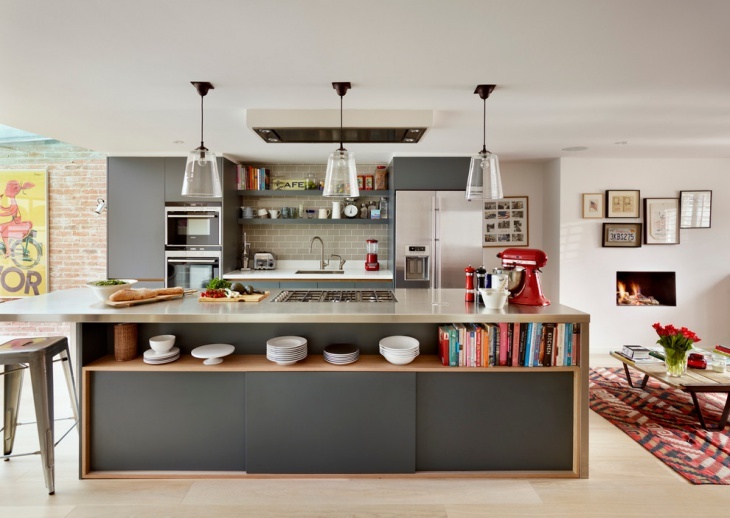 It also has 3 unique stylish lights hanging, a rug with a red and black pattern which is placed to the right side of the kitchen. 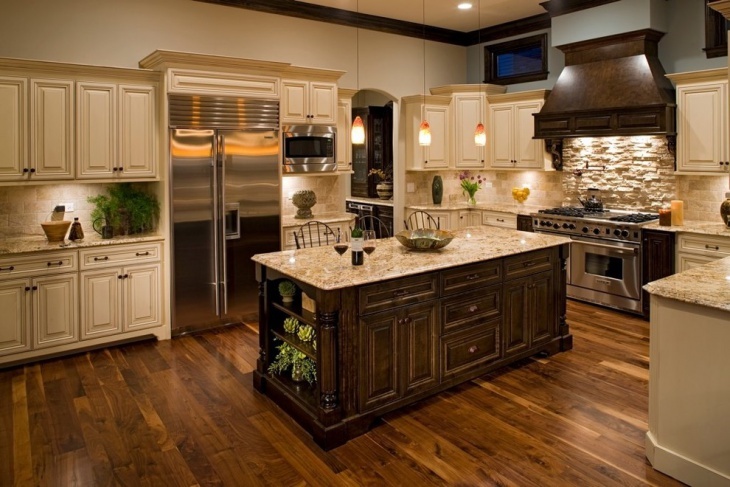 This is a traditional kitchen which has a luxurious finish to it, featuring a gold granite countertop with dark wooden cabinetry and hardwood flooring, this kitchen space has a rustic touch to it, also coupled with royalty. 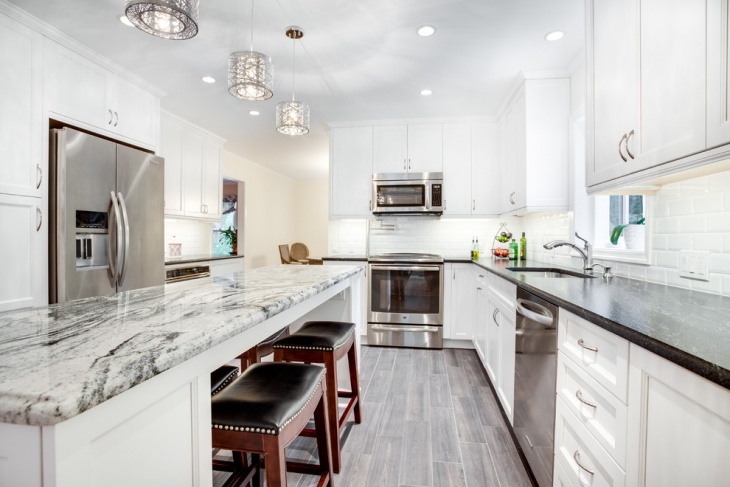 It also has white cabinets that are spread across the kitchen. 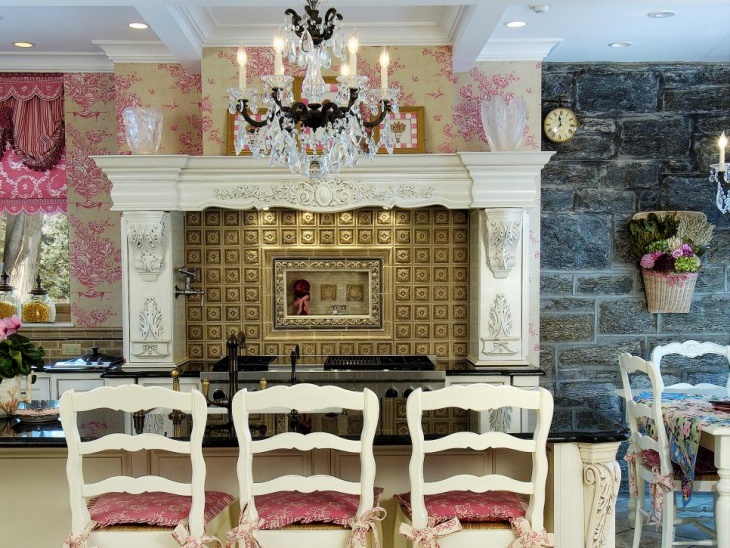 This elegant kitchen featuring crystal chandelier has a unique mid-century style in it. The wall of one side is made of old-fashioned stones from the medieval era, and to the other side, there’s a pink and off a white floral wall. Just above the stove is a gold backsplash in this kitchen space. 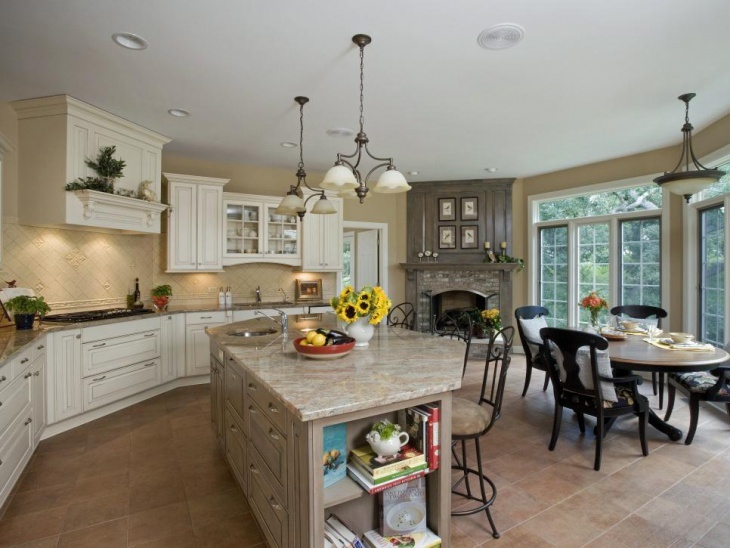 This large and spacious kitchen featuring a round dining table within the kitchen space has a marble countertop in light beige along with an under mount sink. There’s also a fireplace inside this kitchen for warming up during winters. 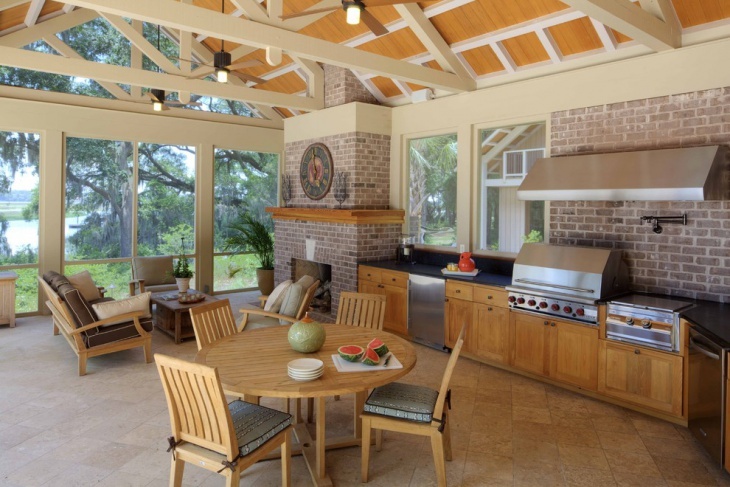 The light beige flooring complements well with the entire décor of the kitchen. 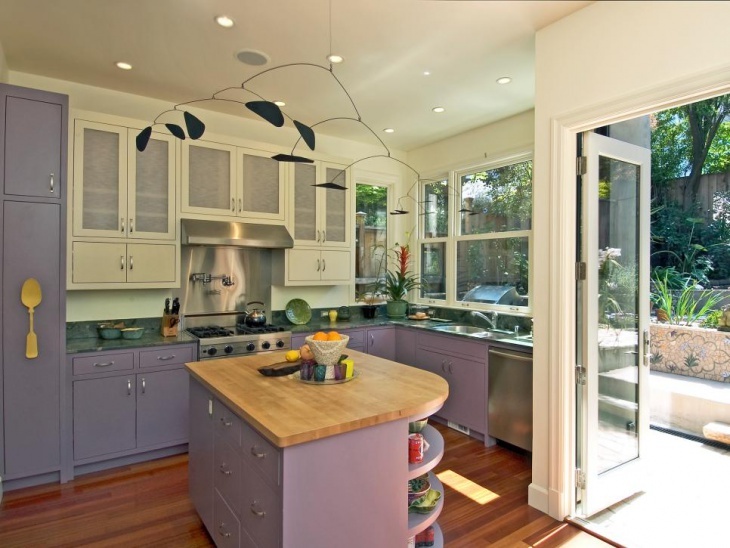 This purple and white kitchen is strikingly unconventional and has wooden flooring with purple cabinets on the bottom and white at the top. It features a mini cabinet with a wooden countertop that is used for chopping and cutting fruits or veggies. 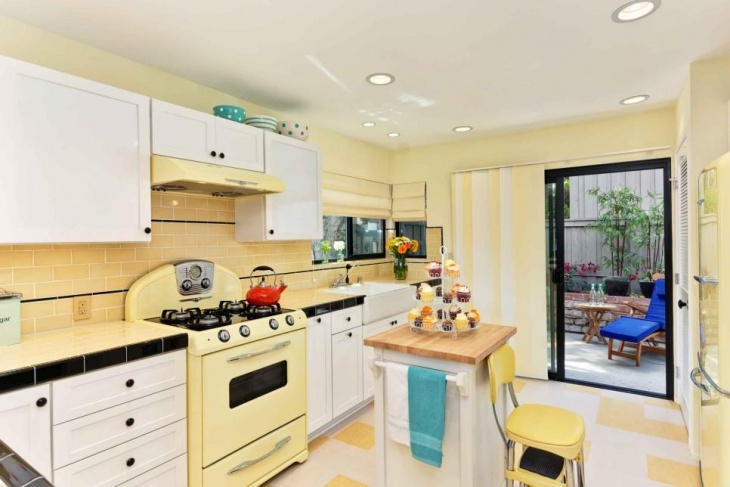 This retro style kitchen featuring yellow walls, white cabinets and patterned yellow and white tile floor is pretty and compact. The design of this kitchen takes us back to the 80s but is still simple and does not have a heavy décor. 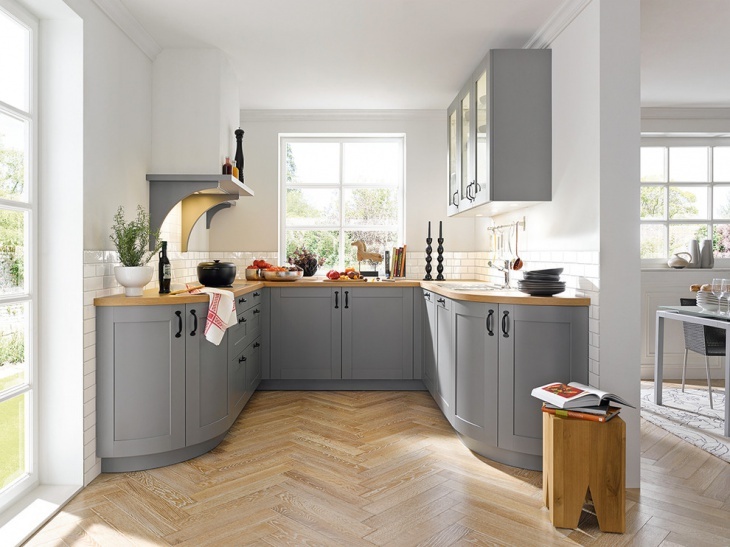 Decorating your kitchen can seem like quite a task because a kitchen is that space of your house where you focus on comfort and convenience rather than the décor. With the above wonderful kitchen designs, we have got you covered on how you can incorporate the various décor styles in your kitchen to make it sleek, stylish and well organized.